Custom Imprint These Dice Key Chains with Your Logo on the One Side of the Dice! Our 5/8" (16mm) Dice Key Rings can be custom printed with the one-color design of your choice on the one side of the dice (sides 2-6 of the dice feature pre-printed dots). 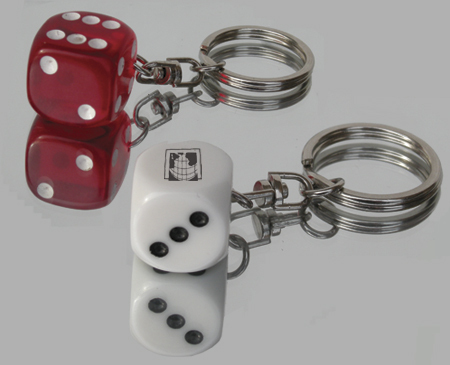 The White Custom Dice Key Chains are made of opaque urea plastic, and the Red Custom Transparent "Casino-Style" Dice Key Chains are made of acrylic plastic. Great for promotions, trade shows, gift shops, special events, and more, the Imprinted Dice Key Rings showcase your logo on the one/ace side of the dice. And, with their slightly rounded corners and 5/8" size, our Dice Key Chains fit comfortably in anyone's pocket.